I’ve been tracking my heart rate during workouts for some time now and it has always troubled me how high it is when I work out. Based on the premise above, I should be working out to a heart rate of 152 bpm if I am at 85% of my estimated Max heart rate – 161 if I push it to 90%. That’s well below the 200 mark I often record when I do Tribe Boxing or Flycycle. If I tried to stick to 152 bpm, I would hardly be working out at all! Remember that leisure hike/photoshoot at Sungai Pisang? I recorded a maximum heart rate of 168 walking along the river. The last time I went running with #FMR, I was at 130 bpm just walking out to the road and I hadn’t even started running! The closer you are to your MHR (maximum heart rate) during your workouts and races, the shorter the duration of exercise that you will be able to maintain at that pace. If you can maintain a rate of 160 during your workouts and races, your MHR is well above that. I have been running with #FMR for some time now and his heart rate looks like my leisure hike at Sungai Pisang compared to mine. The following stats are from a recent run (left: mine, right: #FMR). We ran together almost the entire way, keeping the same run/walk pace until the hill at the end when he took off and I held back because my knee was hurting too much. According to these stats, my average heart rate was higher than his max heart rate. If he hadn’t raced up the hill, his max heart rate would have been even lower. How does #FMR maintain such a low heart rate? Is there something inefficient about my heart? What can I do to make my heart more efficient? I’ve never been a sporty person. I didn’t really get into fitness until I was an adult. #FMR on the other hand, has been involved in sports for the bulk of his growing years. Given the massive amount of development that occurs in a growing adolescent, it’s hard not to see how all that sporting experience might affect the development of his heart and it’s capacity. You know the saying – use it or lose it. #FMR worked out a lot in his formative years and his heart would have developed to accommodate those activities. I, on the other hand, was pretty sedentary so my heart rarely had to work very hard. It makes sense that our divergent lifestyles had opposing effects on the development of our hearts. We know that athletes have larger hearts as a result of their intense physical demands. Is it really such a leap to suggest that physical activity in the formative years would impact the growth of the heart? Of course, there are also genetic differences that we should not over look. While I was griping about my “crappy” heart and being envious of #FMR’s more superior one, I discovered something else. I can chug quite comfortably at 180 bpm without suffering too much for it. #FMR confessed that he would struggle to maintain that heart rate for long. According to Bicycling, “Max HR is largely untrainable and determined by genetics—some of us have hearts tuned like humming birds’ while others have the slow-and-steady type.” Right. So I’m the humming bird and #FMR is the slow-and-steady type. If not by heart rate, then how do we know when we’re working out too hard? I’m not sure where we got this idea that the fitter you are, the lower your heart rate should be when you’re working out. I don’t even know why there is this insistence that working out at a “high” heart rate is terribly dangerous and something you should never do. How high is “high” anyway? Certainly not that arbitrary 220 minus your age rule. It’s laughable that I can bring my heart rate up to 85% of “maximum” just by walking briskly. The 220 minus your age formula is a rudimentary system—like, “might as well use an abacus as a bike computer” rudimentary. It’s been the standard for years, but there are many variables that can throw off your max HR, like how fit you are, how hot it is, and how much stress you’re under. The whole obsession with high heart rates when exercising is linked to the idea that working out beyond your maximum heart rate could lead to a heart attack or your heart exploding. I mean, we’ve all read about that guy who dropped dead while exercising. Surely it was because he pushed himself too hard, right? Well, not quite, because there’s this thing called built-in drive called “self-preservation” and it’s a really strong instinct. At max heart rate, most of us can only last one to two minutes. You would have to be a highly trained athlete to continue for longer. 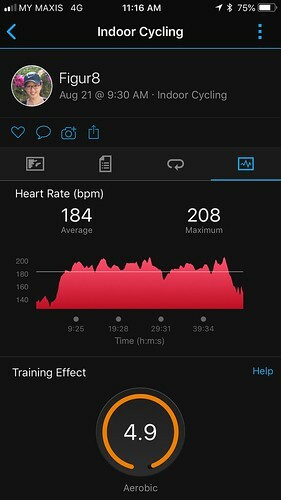 Since I can complete an entire workout at 179 bpm, it cannot be my maximum heart rate. Anyone working at maximum heart rate will find their performance declining quickly. As they put it so succinctly at Bicycling – “years of evolving to survive prevents us from actually killing ourselves”. So how did that guy drop dead while exercising? Possibly because he had an underlying medical condition. Remember those recommendations to check with the doctor before engaging in any exercise program? That’s why. Going from couch to 100 is probably not a good idea either. If you’ve been sedentary for a while and suddenly decide you want to get fit, jumping into the middle of the ocean and expecting to swim to the nearest shore is definitely not recommended. It’s the fastest way to injury. If you’re just starting out on the fitness journey, it is advisable to start slow and gradually build yourself up. When do you need to be worried about your exercise heart rate? If you’ve got pre-existing heart disease or risk factors for heart disease. In both these cases, you should be seeing a doctor before you work out anyway. If you’re part of the aging population, you should also be seeing the doctor yearly for a medical check up. Making sure that everything in your body is functioning well and that you’re good to keep going as you are is always a good plan. Rather than relying on heart rate numbers, Dean Golich, head performance physiologist for Carmichael Training Systems, prefers the use of personal judgment on how hard we feel we are working out. Max heart rate workouts should be done sparingly because the ultra-high intensity can lead to injuries, extreme fatigue, and other symptoms of over-training. Warning signs that you’re over doing it – when you get chest pain, dizziness, shortness of breath, or joint pain that doesn’t go away. Other signs include falling ill frequently, consistently struggling to complete a regular workout, feeling tired and moody after the workout, craving more sugar than usual, or gaining weight even though you’re exercising a lot. Note to self – endurance workouts from time to time are fine, but they shouldn’t be done too often. In other words, marathon, back-to-back workouts should be kept to a minimum. Additionally, you don’t always have to go hard every time because working out at different heart rate zones is beneficial in different ways. Resting heart rate – this is your heart rate when you have been lying down, relaxed for 10 to 15 minutes. It can also be measure when you wake up in the morning (not with an alarm clock). Generally, fitter people have lower resting heart rates. Recovery heart rate – how quickly your heart rate returns to normal after working out is also a good indication of your fitness level. The faster the recovery, the fitter you are.